While there are a few short segments on this route that are on dirt trails, this is almost completely a paved ride, so don't hesitate to do this on skinny tires, if you have the option. The dirt trail sections can be easily bypassed or maybe even ridden by road bikes. The ride starts from the Marina Green parking lot and traverses the full length of the Golden Gate Promenade through Crissy Field. This area is great for crowd watching or for puppy watching. If you start the ride very early in the morning, your crowd watching might have to wait until your return along this same route, though; the crowd usually doesn't pick up until midday. You'll also get great, full-frontal views of the Golden Gate and might catch the opportunity to watch kitesurfers here, as well as a few other types of marine recreation. Before getting too close to Fort Point (which you can opt to visit, by extending this ride), the route turns to climb up to the bike access way to the bridge. You turn onto Long Avenue for this, which is right behind The Warming Hut (which is a great place for a pit stop, coffee, lunch, snacks, or parks and recreation books, by the way). The climb involves about one block of riding with traffic, but you'll be back on paved bike paths in no time. When you are, you'll be following this very popular path all the way to the bridge, and first-rate views of the bridge will start opening up to you very soon. As you get on the bridge, if you're doing the ride on a weekend, make sure you cross under the bridge to get to the western side of it (as does the route plot on this page), because bicycles are restricted to that side of the bridge on weekends during daylight hours. You'll be happy about that, because it also means that pedestrians are restricted to the other side, so they'll be out of your way. The full rules as to which side of the bridge can be used by bikes at any given time are a bit more involved than just this, though, and they actually change seasonally. As you might expect, riding on Golden Gate Bridge is a treat even for people who have done it before. While you don't get as direct a view of the city as the pedestrians on the eastern side of the bridge do (unless you do the ride at a time that allows you to ride on the eastern side), you get a nice look at the slopes of Marin Headlands, which you'll shortly be climbing yourself, and at the open ocean. Once you reach the northern end of the bridge, you'll be faced with a number of options. First of all, whichever other option you pick, you can always take a short side trip to the popular vista point on the other side of the bridge on this end. To do that, you'll have to cross under the bridge once again. This involves going down and then up a couple of flights of stairs. Carrying your bike through these is made a little bit easier, though, by the existence of a flat "plank" that follows along the edge of both staircases on which you can walk your bike. Visiting this vista point would also present the opportunity for another restroom break. The other choices with which you're faced at this point in the ride are doing the Marin Headlands and Rodeo Beach segment of the ride, doing the Sausalito part, doing them both, or doing none. By bypassing the headlands section of the ride and continuing straight to Sausalito (down Alexander Avenue from the vista point) you'll shave off more than 13 miles of distance and over 1700 feet of climbing from the totals of this ride. If you're not in any good physical shape, you might seriously want to consider doing this. Whether you bypass the headlands section or not, extending the ride to Sausalito adds 300 feet of climbing on Alexander Avenue on your way back (and about 4 extra miles) to your total. If you're doing the ride with small children who are not used to riding long distances, you might seriously want to consider turning back from the northern end of the bridge. If you don't have small children with you, extending the ride to Sausalito is not a serious challenge if you're in any reasonable physical shape. As for including both the headlands portion as well as Sausalito, refer to the numbers I've quoted above and read my description below to see what you'd be missing, and decide accordingly. The route plot for this particular ride continues directly up Conzelman Road after crossing the bridge. This road climb (open to fairly heavy traffic, especially over its first third or so) is the only serious climb of the ride and lasts for about two miles, though that includes an almost flat section in the middle. The steepest segment is a short part in the beginning averaging around 11% grade. The other part of the sustained climb (near the top) does not exceed 9% very much. This is not a challenging climb for anyone who has done any amount of climbing on a bike before. Conzelman Road features a string of parking areas at which visitors can stop to take in the views, which are phenomenal. This whole road is essentially one big vista point. As the climb takes you higher and higher, the views get wider and wider. At the top of the climb, you'll reach the last parking area near Hawk Hill, which is also the turnaround point for most tourists driving up there. Hawk Hill also happens to be a popular spot for bird watchers for spotting raptors in the air. (That might explain the name.) Apparently, birds flying north or south along the coast typically cross over the Golden Gate, because they have an aversion to crossing long distances over open water (presumably excluding sea birds) and look for the shortest water crossing that they can find. Naturally, the Golden Gate happens to be that spot for any bird traveling along the western half of the bay and, therefore, has a "funneling effect" that helps birdwatchers and bird census takers immensely. Past Hawk Hill, one of my favorite parts of this ride starts, as Conzelman Road unexpectedly changes direction, attitude, and scenery all at once, and starts a steep one-way descent toward Point Bonita lighthouse. This is also the spot at which views of Rodeo Beach and the rest of the coast northward suddenly open up to you. The route then takes you along a short and pleasant series of gentle curves atop a low coastal ridge, past a string of World-War-II-era artillery batteries, before bringing you to the doorstep of the walkway that leads to Point Bonita lighthouse. If you feel like it, it's an entirely feasible idea to add an additional diversion to your ride by locking your bikes somewhere around there and taking the scenic hiking-only path to Point Bonita (over its knife's-edge rocky path, pedestrian tunnel, and suspension bridge) to see the lighthouse. The route then rambles around to another vista point with views of Rodeo Beach before descending to Rodeo Beach itself. Notice that that particular vista point will require you to traverse a gravel path or two, so those riding on skinny tires may want to consider whether they'd rather bypass that part and head directly toward Rodeo Beach instead. Naturally, Rodeo Beach is another stop you can bypass if you are short on time or energy. 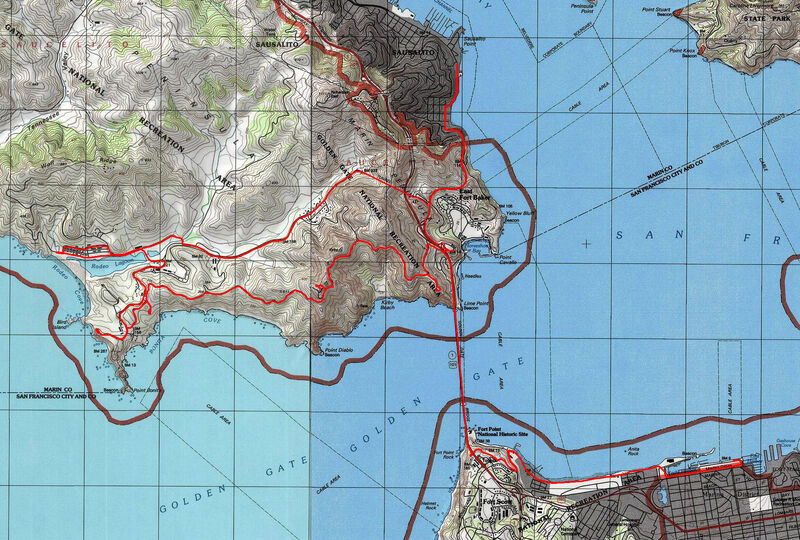 However, if you do ride this portion and if you precisely follow the GPS track downloadable on this page, it'll also take you past an outdoor whale skeleton on the back streets (Kirkpatrick Street) of the Headlands Institute complex. This part of the ride also happens to be the point at which many riders also include an out-and-back side trip up Coastal Trail from Rodeo Beach to visit the decommissioned Nike missile site on a nearby hilltop known as Hill 88. If you decide to take that side trip, keep in mind that it adds about 900 extra feet of climbing to the ride and, while part of the trail is paved (depending on where you start from), it's mainly a dirt trail that leads up there, and a portion of it that bypasses a spot where the main wide dirt road has slid into the ocean years ago is very steep, quite rutted, and technical. As the route leaves Rodeo Beach behind, it traverses a very short segment (0.4 miles) of Miwok Trail before returning to Bunker Road. If you'd like to avoid that part, simply stay on the pavement and you'll shortly end up in the same place. Where the ride takes you next is a motor-vehicle tunnel that you ride through. Often referred to as the "Five-Minute Tunnel" (from the duration of the red light at its entrance), this tunnel is just under half a mile long and pretty narrow. But bikes in the tunnel are formally accommodated. Make sure you obey the traffic light at the tunnel entrance; the tunnel is one-way and traffic from either direction takes turns driving through it. If you hit the bicycle switch at the tunnel entrance on your way in, drivers entering the tunnel are shown a flashing "Bicycles In Tunnel" warning light. Riding a bicycle through a tunnel this long and this narrow is a pretty unique experience that you don't get to have very often. On the other side of the tunnel, you'll meet Alexander Avenue, which will take you down to Sausalito. This is the part of the ride where you'll be sharing the road with some busy street traffic. But, you won't be the only bicycle on the road. Riding into (and through) Sausalito will provide you with much inspiration for a coffee or lunch break. Pick a place that grabs your fancy, and kick back a little before starting the return trip. On your way back, there'll be about 300 feet of climbing on Alexander Avenue, as I mentioned before. But, it goes by quickly. If you're tired at this stage, just take it slowly and it'll be over before you know it. One last thing worth paying attention to is that, as you are approaching the tunnel through which Alexander Avenue passes under Highway 101, the designated bike route actually does not go through the tunnel. It crosses the road just before it and heads toward that major vista point on the other side of the road instead. This doesn't stop many cyclists from passing through the tunnel anyway, but the tunnel (though very short) is pretty narrow and the visibility is not the best. So, you'd only be helping yourself if you take the safer option and follow the formal bike route here. I should add that one other way of finishing this ride is by returning to San Francisco by ferry. That is probably more commonly done by extending the ride to Tiburon first, and then by taking the ferry from there, though you can technically take a ferry from Sausalito to San Francisco as well.